We recently released PX-Enterprise 1.1.6, the latest release for our flagship data layer for containerized workloads. With this release, PX adds many features requested by the growing list of enterprises customers relying on PX for running stateful containers in production. If you’re already a PX user, we think you’ll enjoy these new features. If you’re not, request a demo today. One of PX’s most popular features is support for Amazon AWS groups, or ASGs. 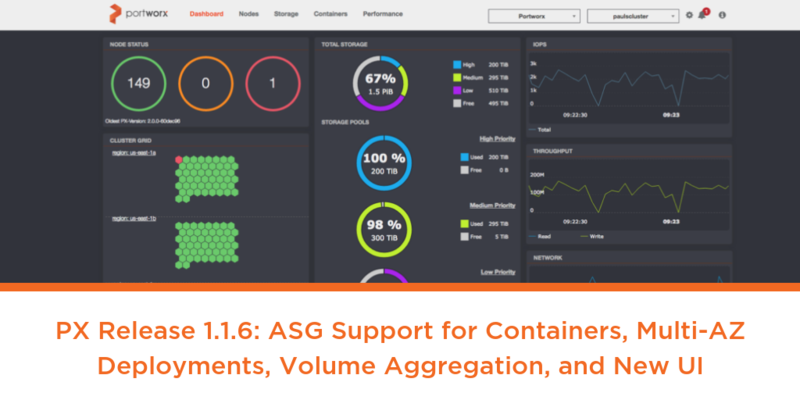 Container uses often complain that ASGs done work well out of the box because when your ASG scales your cluster, it spins up new hosts but those new hosts don’t have access to the data that your stateful services were using. That means if you are trying to autoscale Cassandra or Mongo or ElasticSearch with Docker, you can easily spin up a new container, but it won’t have its data. 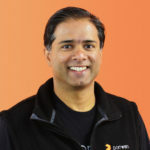 Portworx solves this by managing the EBS provisioning and replication of data to new nodes in the ASG so that any container scheduled on any host can access its data volume. With 1.1.6, we have simplified the integration with ASGs even further. Previously, when an ASG spun down nodes, the PX service running on those nodes would be removed as well. This is a normal operation, but the PX monitoring interpreted this action as a warning that the cluster was in trouble. With 1.1.6, PX correctly interprets the spinning down of nodes as a normal cluster operation when using ASGs and maintains the cluster in a healthy status when this happens as long as the number of replicas requested by the user is still met. Now PX-Enterprise users can seamlessly integrate with auto-scaling groups and elastically scale up and down their workloads managed by Kubernetes, Mesos and Swarm. Customers use PX to make sure that their stateful services are always available. One of the most common failures that can result in application downtime is a data center outage, say in a single AZ at AWS, or a in a single rack in an on-prem datacenter. To combat these outages, we have added more datacenter- and rack-awareness algorithms in PX-Enterprise to automatically determine the location of nodes and place replica sets in different fault domains. Basically, that means that if you give PX servers that span multi-availability zones in your cloud or multi-racks in your datacenter, we will automatically spread out your data replicas across those zones or racks, making you less susceptible to these common failure modes. This takes a lot of guess work and manual configuration away from DevOps and Infrastructure engineers so they can focus on making their apps better. Let’s say you have a three-node PX cluster, with 1 TB of storage on each node. Let’s also say you are running ElasticSearch and you have 1.5 TB of data. No problem, PX can “stripe” or distribute your volume across multiple nodes without any changes to in your application. We call this volume aggregation and it allows any volume to access the storage resources of the entire cluster. This volume aggregation feature, available since the 1.0 version of the product, just went through some major upgrades with enhanced algorithms for doing data striping across cluster hosts, while keeping the data as close together as possible, enabling better application performance even when data is distributed. Combined with our intelligent AZ and rack-awareness primitives, this enables our customers to maximize their public and private cloud investments by delivering best-in-class performance at a fraction of the cost on either public or private cloud. 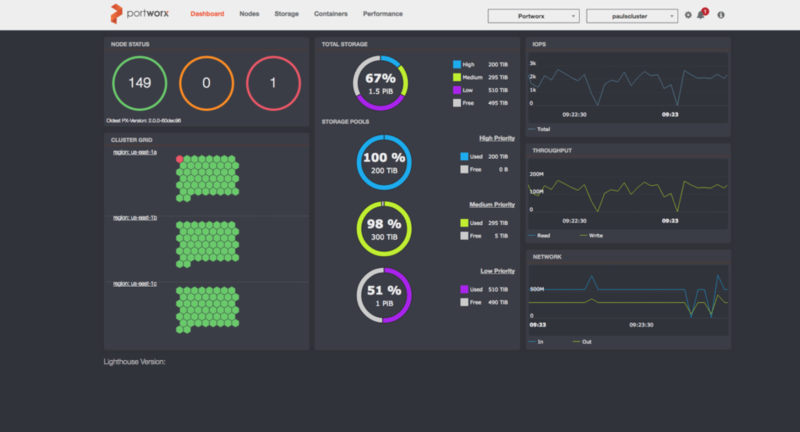 We have also released an update to our cloud-based container data services management UI, Lighthouse, which enables customers to manage their mission-critical cloud-native infrastructure via an always-on management UI delivered as a SaaS. With this release, Lighthouse can scale to thousands of nodes and provides an updated interface with sharper view of the cluster, including the new multi-AZ and multi-rack features outlined above. Lighthouse is also available to be run on-prem for customers with particular governance and data locality requirements. We hope you enjoy these new features of PX. We have more releases in the pipeline for PX-Enterprise and Lighthouse to announce shortly so stay tuned and watch this space!